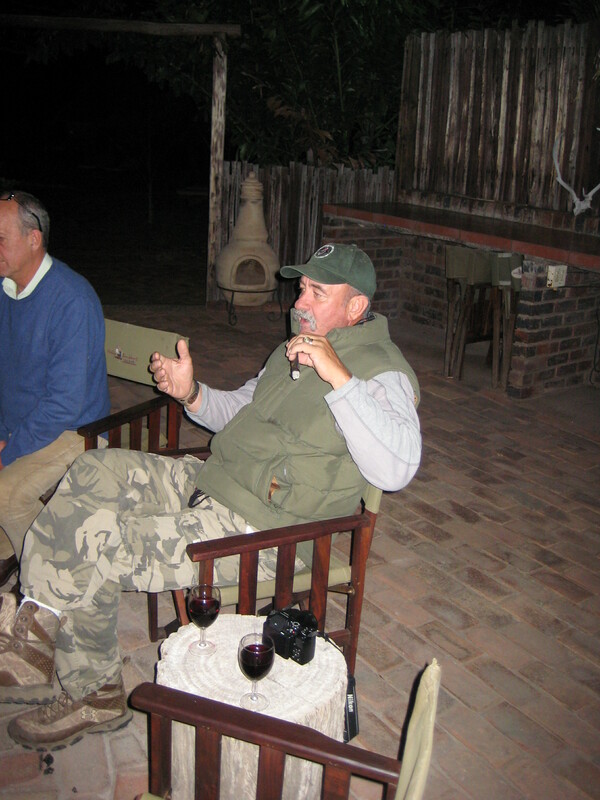 In general, hunting men don’t mind roughing it when out hunting or on a safari. Hunting men will go days without a shower and will sleep anywhere, including Bwana Mbogo. 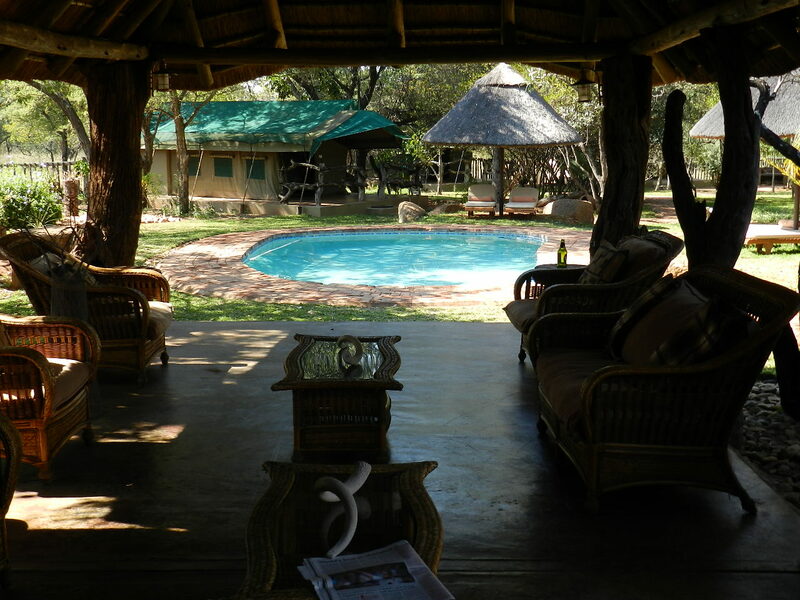 In general, hunting women are willing to rough it and don’t necessarily require a bed, shower, air conditioning/heating, electricity for the blow dryer etc… When I first heard that we were going on a safari, one of my curiosities was accommodations. I don’t mind camping and not taking a shower if I can have a daily sponge bath, and I can cook by campfire, but I’ll be honest that I also like a nice bed with crisp sheets, a hot shower, an air conditioner and/or heater and a full functioning kitchen to prepare a meal (if I can have the meal prepared by someone else, that’s even more luxurious!). Bwana Mbogo fielded many questions about what we were going to have during our African safari, but he didn’t know the specifics as we hadn’t received that information from the outfitter. So I was ready to rough it and just enjoy the experience. 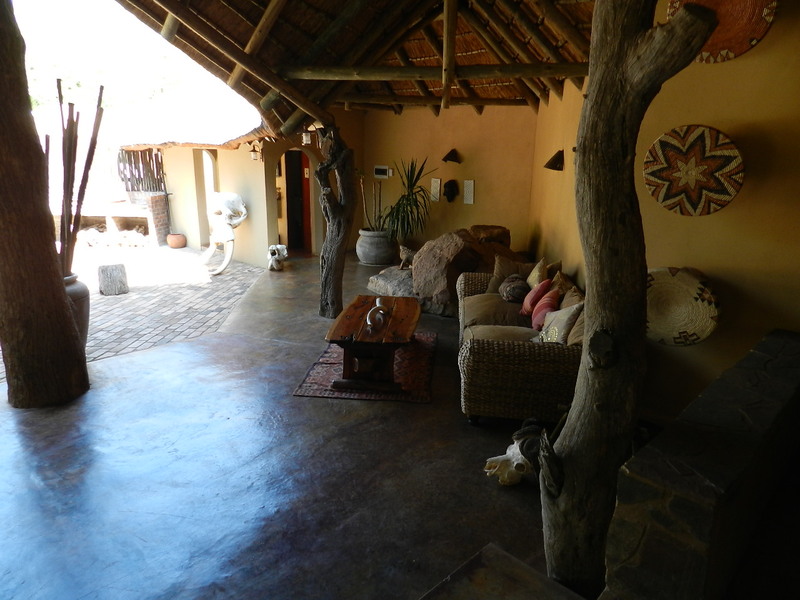 After almost 48 hours of travel by air and by car, we arrived at the game farm lodge. We were greeted by one of the employees with a warm wash cloth to wipe down our, dusty and tired, face and hands. It hit the spot! Our bags were taken to our rooms by another of the employees. We were given a tour of the lodge and were then shown our rooms. I was surprised to see that we were going to be in a ‘fancy’ tent! 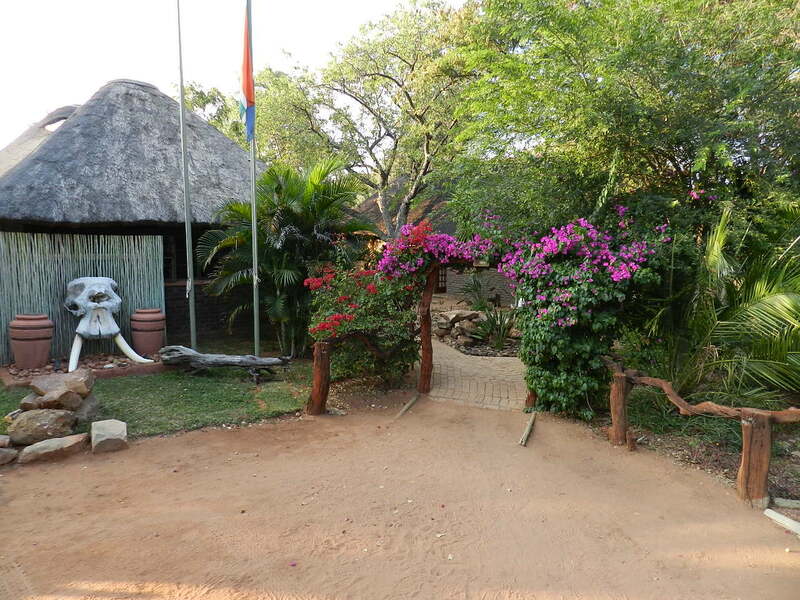 Below is a photo tour of the lodge and tents. Forgive the clothes that had already been unpacked in the photo! Bwana Mbogo started unpacking before I got the camera out to start taking photos! I was so impressed! 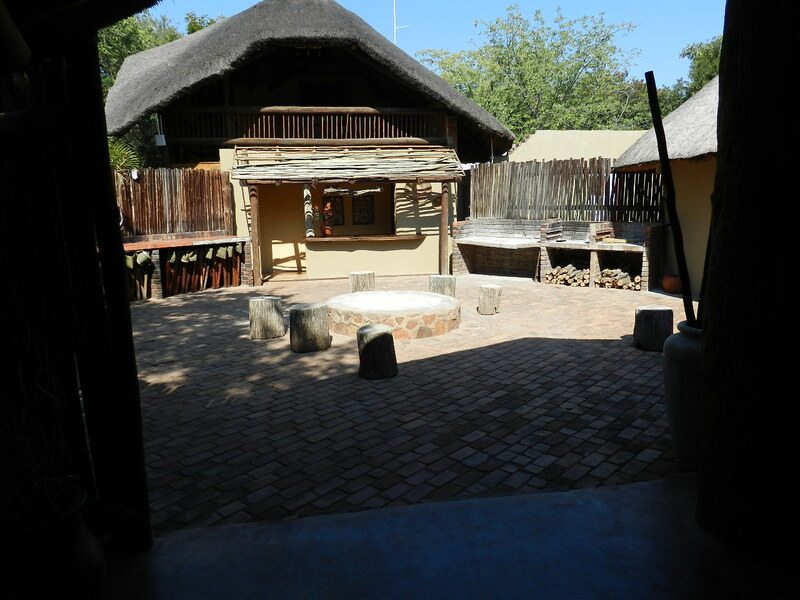 The architect in me really enjoyed the open air lodge, the thatched roofs, and tent rooms. It was comfortable yet rustic. 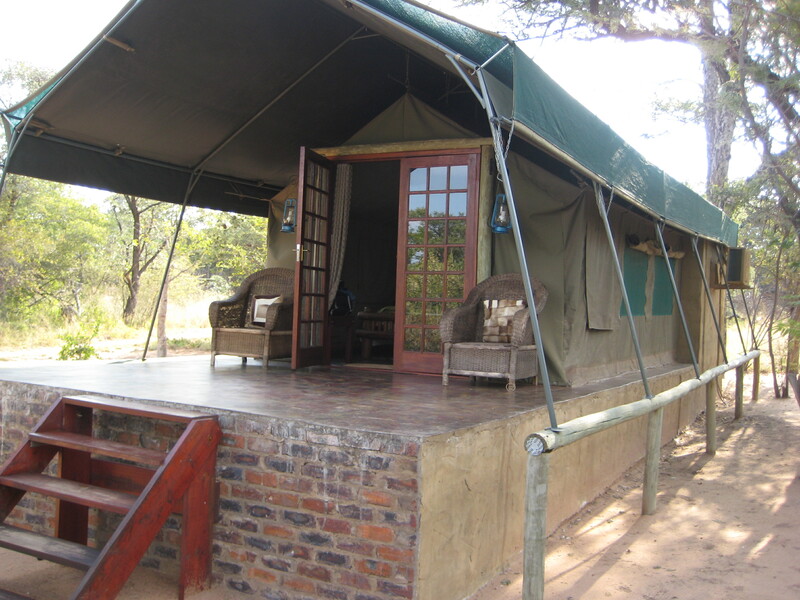 The tent rooms were on a slab, and behind the half wall was the dressing area and the bathroom. I somehow omitted to take a photograph of the bathroom but it had a bath tub, a toilet behind a wall, and a corner sink with an African tall vase as the pedestal. 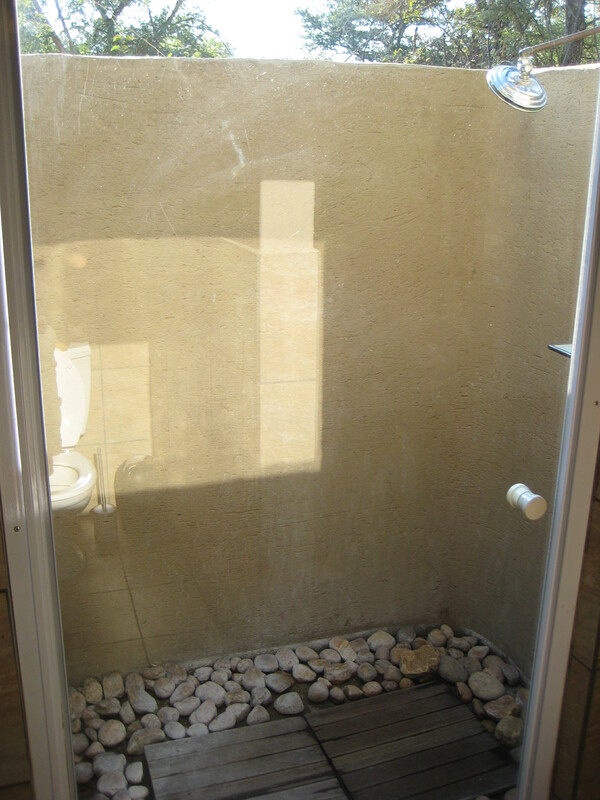 I was skeptical about the outside shower at first, but I tried it the first morning and actually enjoyed bathing under the stars! The water was hot enough that it kept me warm despite the cold temperature at 5 AM! 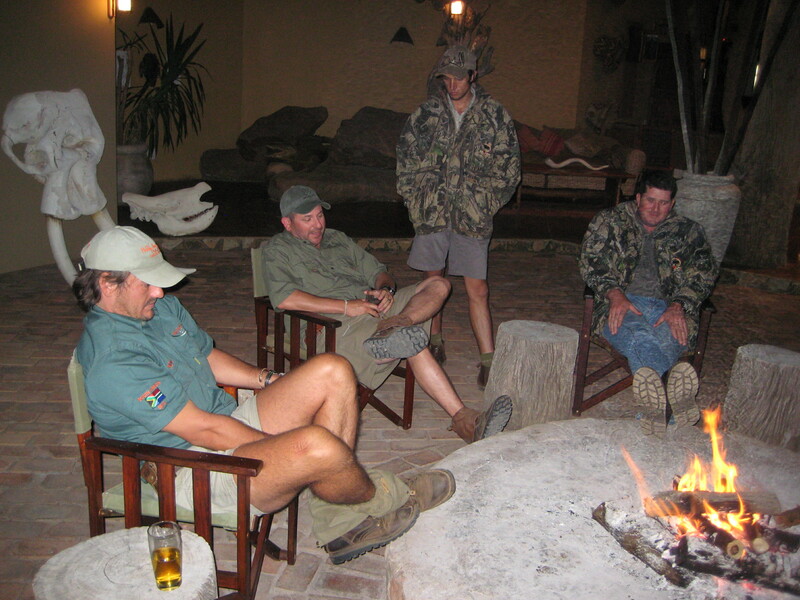 After the evening hunt, there was a fire on the firepit to warm up by and have a few celebratory drinks for the days animals’ hunt. 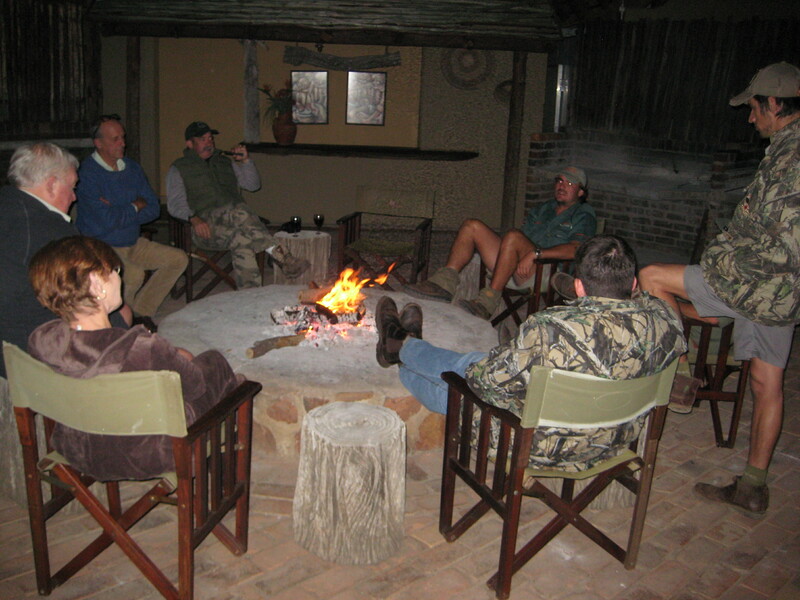 After the dinner meal, most would gather around the fire to chat and exchange stories. I was usually knackered by 9 pm and went off to bed, but I heard that there were some of the guests that stayed up much longer enjoying the evening! 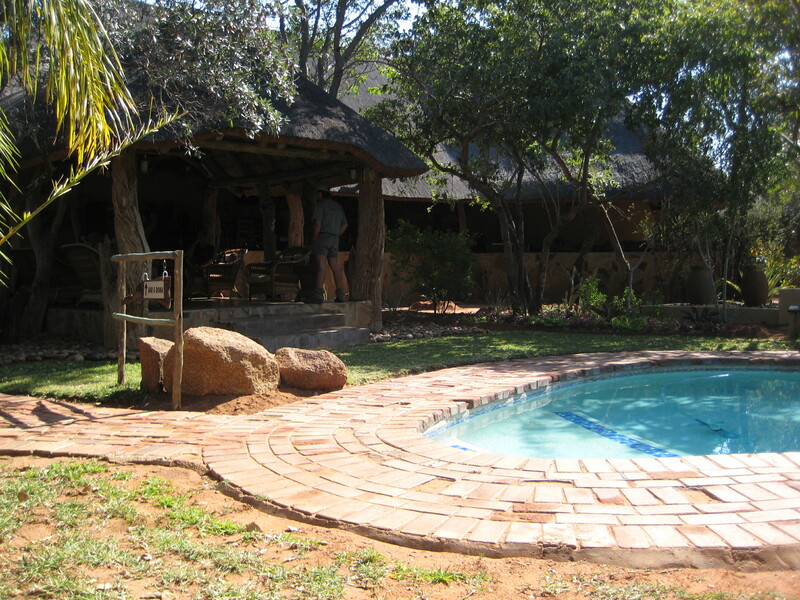 We stayed at this lodge for the first three nights, and then we were moved to another game farm lodge as there was a pre-existing reservation for another group for the rest of our stay. 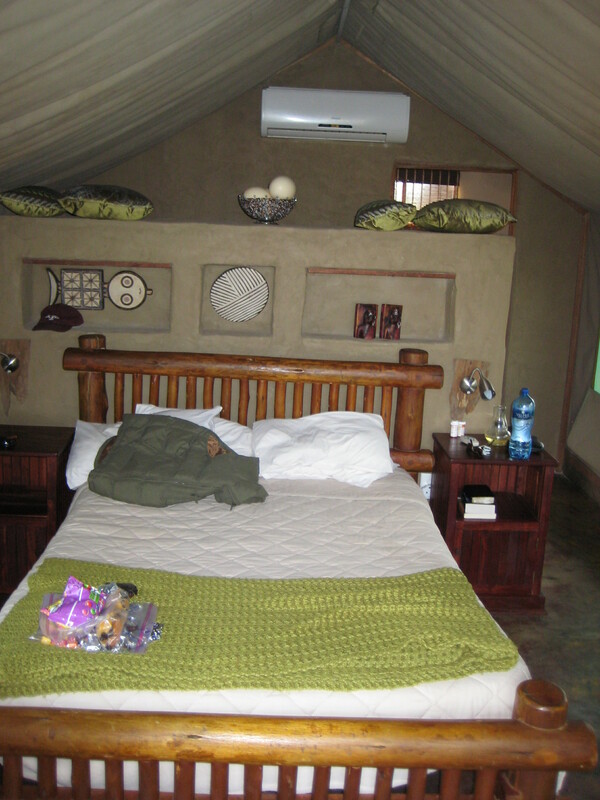 See Safari Accommodations Part Two for photos of the next lodge. 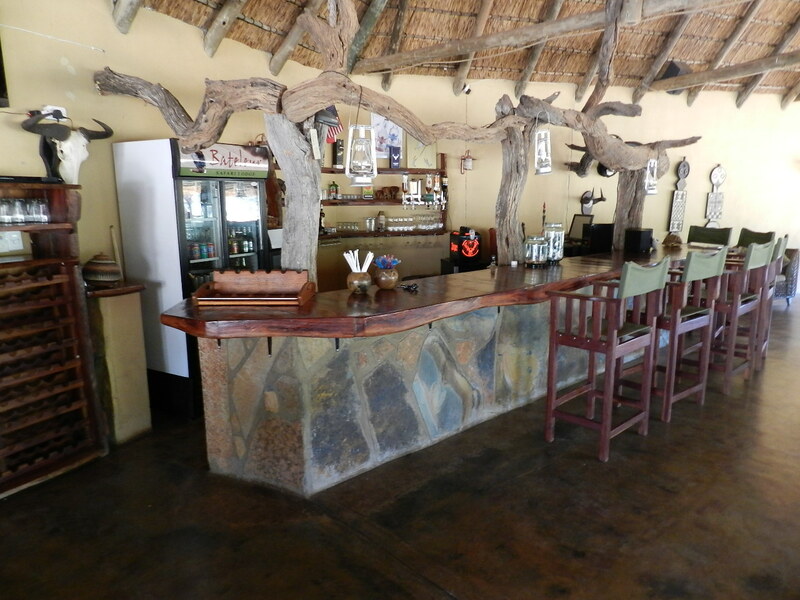 This entry was posted in Accommodations, Africa. Bookmark the permalink.